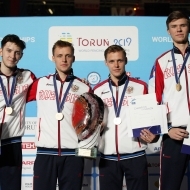 TORUN, Poland, April 14, 2019—Junior men’s and women’s epee teams from Hungary and France scored gold on the last of nine days of fencing competition at the 2019 Junior and Cadet Fencing World Championships in Torun, Poland. There were 41 men’s and 31 women’s international epee teams participating. The Closing Ceremony for the Championships featured the official FIE flag being passed from the Polish Fencing Federation to USA Fencing, who will host the Junior and Cadet Fencing World Championships in Salt Lake City in April, 2020. In the junior men’s team epee event, Hungary faced the USA in the final round, taking the gold with a score of 45-31. USA beat France in a close semi-final, 45-44, and Hungary overcame Russia, 45-26. The bronze medal went to France against Russia, 45-43. France overcame Russia in a close junior women’s team epee gold-medal match, 45-43. Russia defeated USA in the semi-final round, 45-42, and France beat Switzerland by a single point, 45-44. Switzerland took the bronze medal over USA, 45-38. Final ranking in junior men’s team epee included Hungary (gold), USA (silver), France (bronze), Russia, Italy, Poland, Czech Republic and Spain. 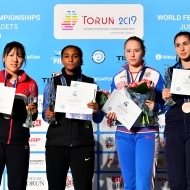 Junior women’s team epee ranking included France (gold), Russia (silver), Switzerland (bronze), USA, Italy, Hungary, Poland and Czech Republic. Complete results may be found on the FIE web site.